PMA Kid: Mindset, Step Aside, New Deal and Wrong Idea are AWESOME! Mindset, Step Aside, New Deal and Wrong Idea are AWESOME! About a month ago, my dad and I went to 924 Gilman to see some great bands. The music was awesome and I got to play basketball before the show with some of the guys from New Deal and Step Aside. 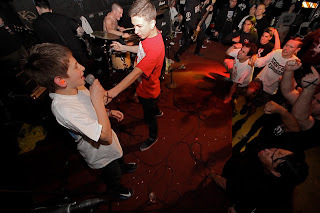 One of my favorite parts of the show was when Gabe from Wrong Idea (he is only 15 years old!) got on stage with Step Aside to play my favorite song, Young Til I Die. My friend Matt Gill caught this really great shot of Gabe giving me the microphone for a second. I had so much fun at that show!!! I think my friend Bryan has the most awesome look on his face in this picture. Everybody should check out Step Aside and Wrong Idea!